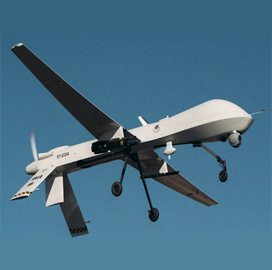 The State Department has approved U.K.’s request to buy $1 billion in General Atomics-built Predator B remotely piloted aircraft and related support from the U.S. government under a foreign military sales agreement between both countries. The U.K. government asked to procure up to 26 Predator B drones, 12 ground control stations, 25 multi-spectral targeting systems, and 25 AN/APY-8 Lynx IIe Block 20A synthetic aperture radar and ground moving target indicators, the Defense Security Cooperation Agency said Wednesday. General Atomics’ aeronautical systems business will act as the principal contractor for the FMS transaction that seeks to support U.K.’s intelligence, surveillance and reconnaissance operations as well as the country’s armed forces involved in counterinsurgency, peacekeeping and counterterrorism missions. The deal also covers GPS inertial guidance units, launch-and-recovery ground control stations, identification friend or foe systems, weapons installation kits, communications equipment, TPE331-10YGD engines, U.S. Air Force and country-specific technical orders, aircraft components, spares, personnel training and logistics support for up two years with an option for additional three years.